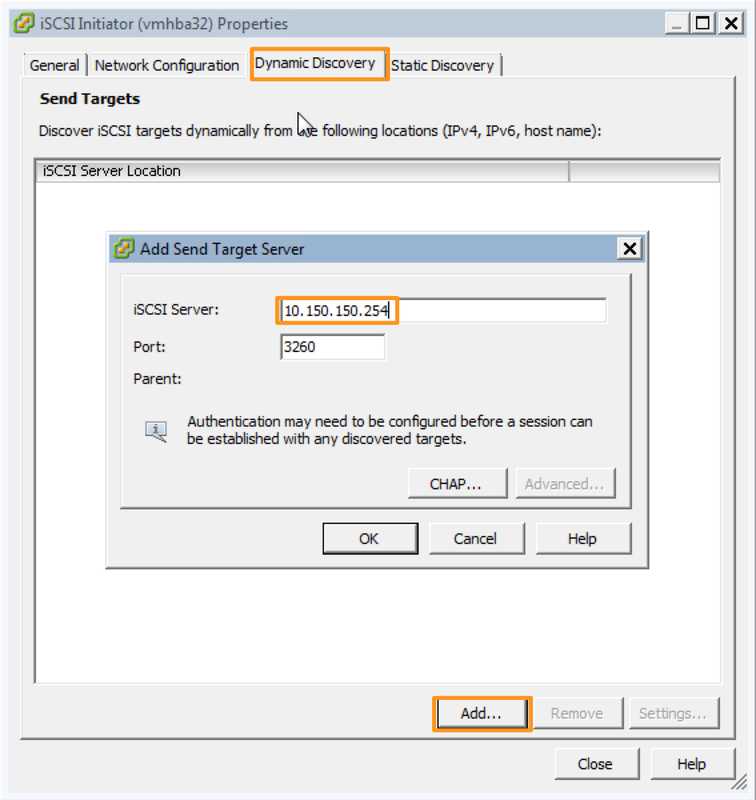 Part 1 of the series, “Configuring iSCSI for CCIE DC” can be found here. 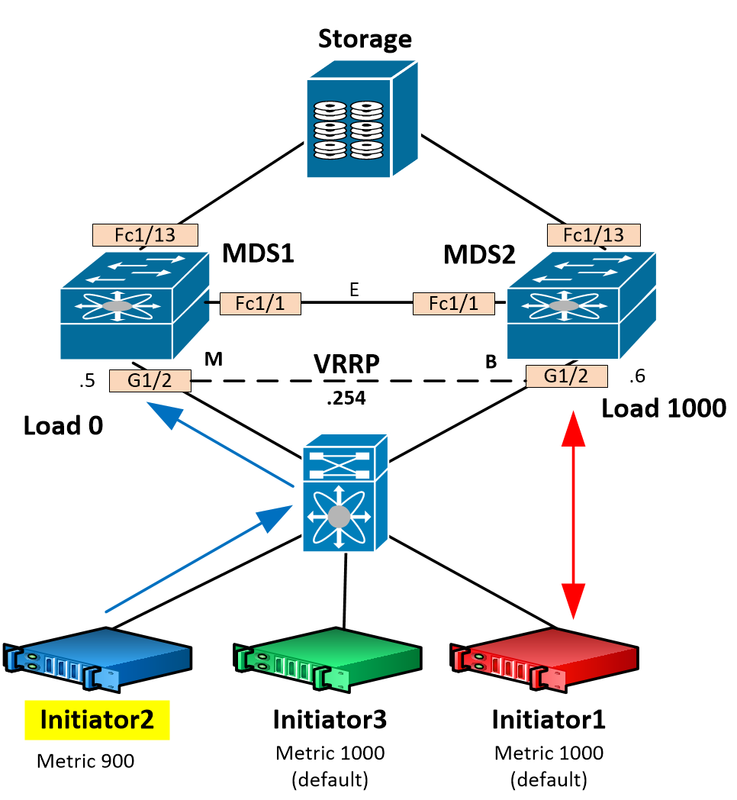 iSLB uses VRRP between two MDS switches for high availability and load-balancing. 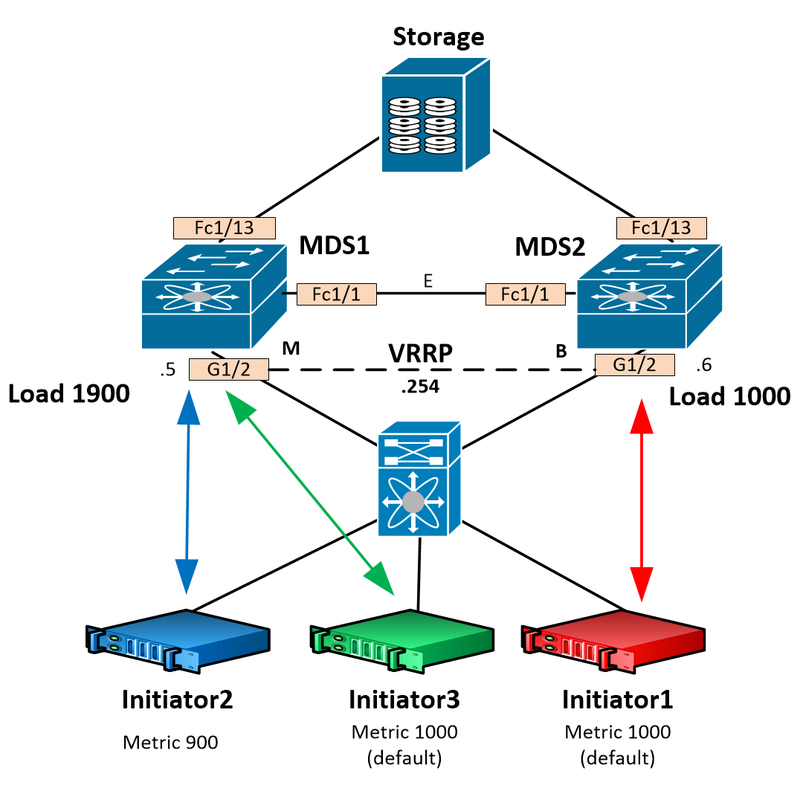 With VRRP you have a master and backup virtual gateway. Typically all traffic is sent to the master active gateway. So how does load-balancing work? A pair of MDSs will run CFS to keep track of an iSLB VRRP table. This table records the current load for each Initiator-to-MDS pair. When an initiator request comes into the VRRP master switch, the table is checked to see the current load on each MDS. The master will take the initiator and create a session if it’s load is lower than the backup switch. 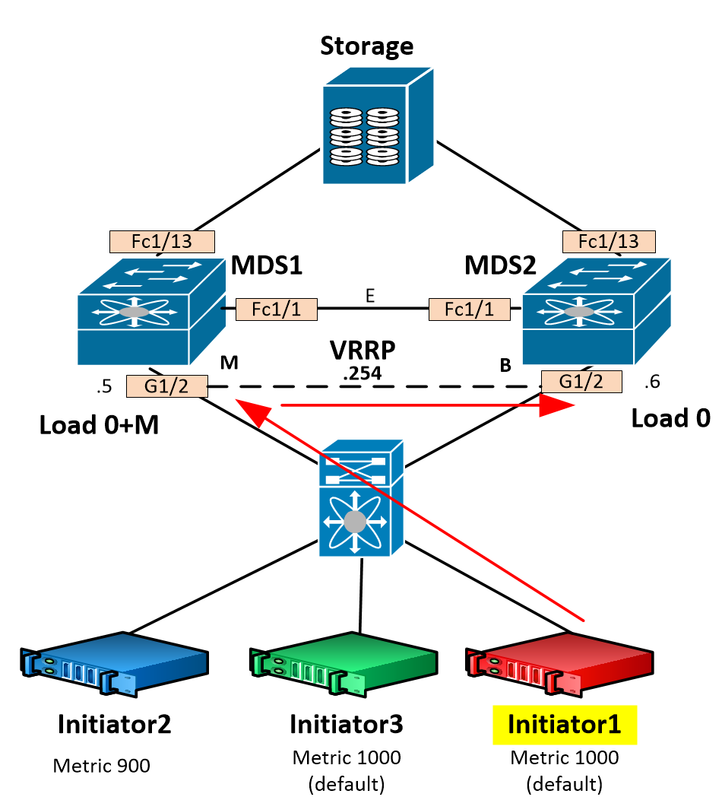 If it’s current load is higher, the master switch sends an ICMP redirect back to the initiator and a new session is built to the direct IP of the backup MDS switch. The default weight (load) for each initiator is 1000. This, of course, can be changed to influence path selection. 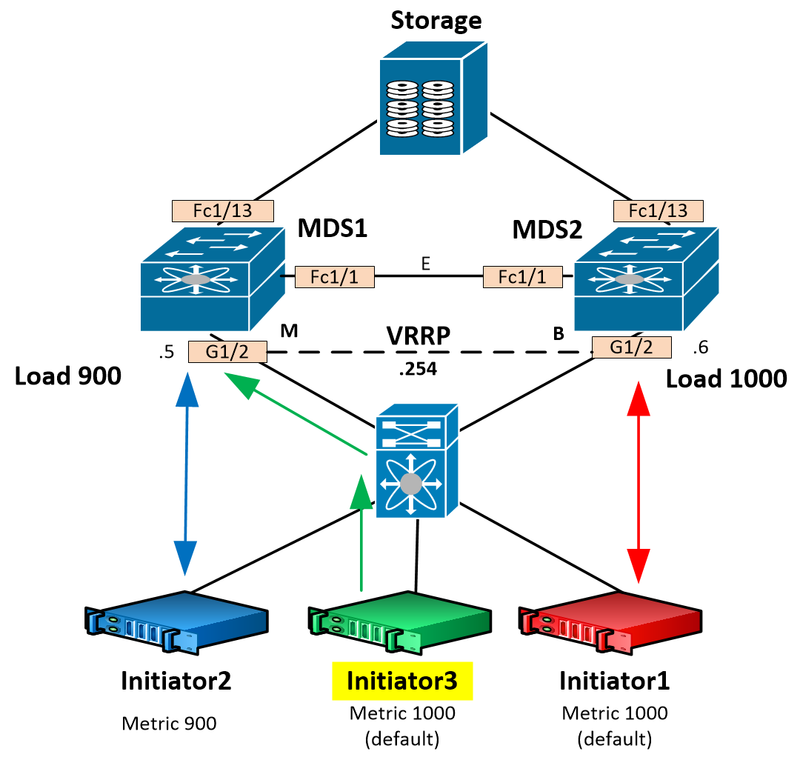 Although not visible initially, the master of VRRP starts automatically with more load since it has more responsibility. 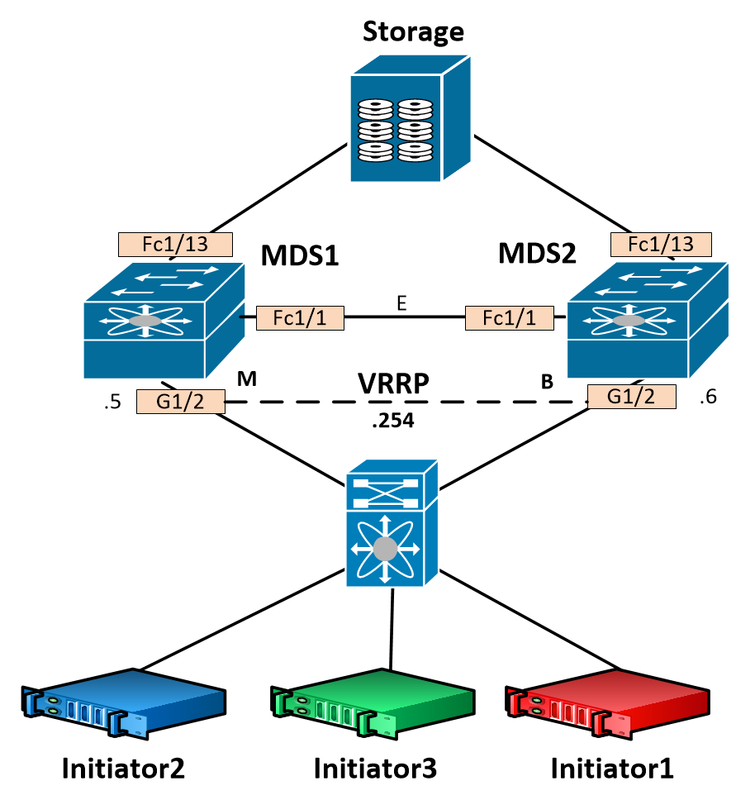 This means that the first session is always going to be redirected and load-balanced to the backup MDS switch. All sessions afterwards will be load-balanced based on load reported in the table. As an example, say we have 3 initiators. Initiator 1 has a default metric of 1000, Initiator 2 has a configured metric of 900, and Initiator 3 has a default metric of 1000. Now MDS1 has a load of 900 and MDS2 has a load of 1000. Initiator 3 sends a discovery and gets load-balanced to MDS1 again because it has less of a load. You can now specify targets when creating initiators. Previously, if doing a static configuration, we had to create the initiator and virtual target separately, and then add the initiator to the virtual target. Gone are those days with iSLB. Added bonus – You can now automatically create zones! This is on by default, so be careful to specify the operator if you do not want the zone automatically created. One caveat, you must already have an active zoneset configured! Beat myself up for a few minutes on that one. Check our current status, we can see that iSLB Distribution is enabled, and we have no active CFS sessions (this only means we haven’t locked the configuration). 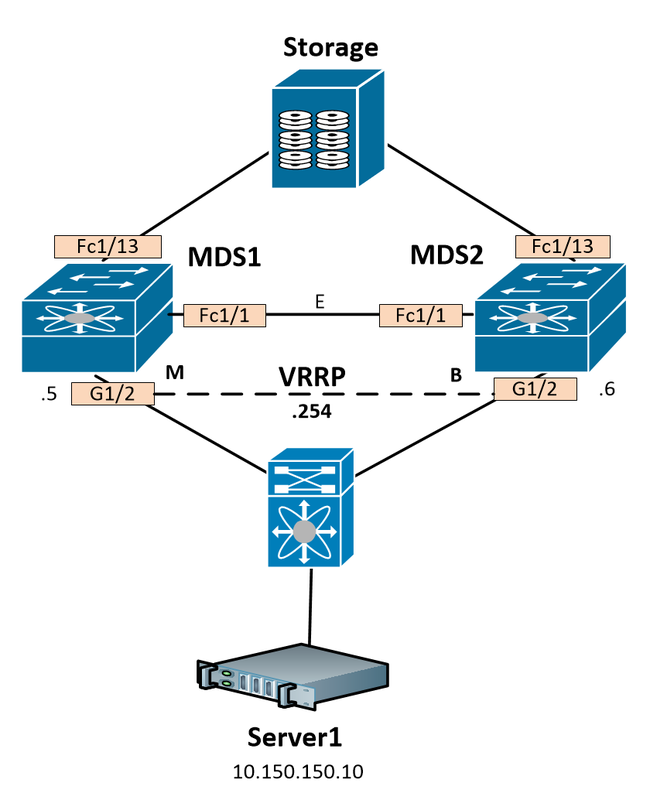 Note, you could also run local-only VRRP between the 2 physical interfaces on the MDS itself. This is useful if you just want link redundancy, not MDS redundancy. The configuration is identical. In the example here, we are using a single physical interface on two separate MDSs. We can run a new command now to get further details on iSLB load-balancing. Notice the table for load-balance interfaces, Initiator assignments (currently empty), and the Initiator Load. So far everything looks familiar except we’re using the word islb instead of iscsi. MDS1(config-islb-init)# target pwwn 22:00:00:1d:38:1c:76:db ? We can set the metric of the initiator if necessary. Default is 1000. By default this will automatically create a zone. If we don’t want this, we need to specify “no-zone” when creating the target. Cool, we just automatically created a zone! Note, that if we decided not to automatically create the zone, we would need to configure this manually. Also, if we wanted to get more granular with the access control, just like iscsi virtual-targets, we can configure islb virtual-targets. Keep that in mind. We now have an iSLB initiator on MDS2, with FCID assigned. We can now see in the iSLB VRRP table that MDS2 has a current load of 1000 based on the Initiator To Interface Assignment. Unfortunately, I only have one server, so I can’t show adding another. I can assume that since the first iSLB session was successfully load-balanced to MDS2 that the next session would stay on MDS1. Very nice write-up!! By the way, I little off topic in here, which font are you using to write this article? Keep up the good work! Thanks for the feedback! I’m using the “Suits” theme, not sure of the actual font name.